What is IBM Blueworks Live? 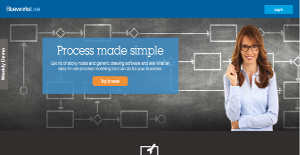 IBM Blueworks Live is a cloud-based business process modeling platform that is built to enable organizations and companies discover and document their business processes, policies, and decisions in a collaborative effort. Simple and straightforward, IBM Blueworks Live also comes equipped with the capabilities to allow users deploy more complicated models. The software makes capturing knowledge seamless and easy, enabling you to create effective models of your business and work on improving your business processes. As you hammer out the kinks out of your processes, your operations become more efficient, teams and individuals become more productive, and business growth is greatly improved. IBM Blueworks Live features a user-friendly interface that enables business and IT users to easily navigate the system without having to spend time and effort getting acquainted with the software. Plus, it is a cloud-based platform which means you don’t have to download or install anything. IBM Blueworks Live supplies you with the tools and features you need to capture businesses processes and decisions. The software allows you to collaborate to better discover those processes with pinpoint accuracy. With IBM Blueworks, you are able to quickly and efficiently retrieve the process activities and milestones and put them out on paper without having to worry about the process logic. Once the processes are discovered and identified, Blueworks Live then create you with a process diagram where you will provide all the data of the process logic and flow. All activities will be assigned to participants found in the discovery map. IBM Blueworks live comes with an automate process feature that lets you build either sequential or parallel activities. This is quite a useful functionality when reviewing and approving types of processes. Collaboration is highly centralized with IBM Blueworks Live. The software utilizes a number of social networking capabilities to implement better communication and enable efficient team collaboration. Features like instant messaging, commenting (process changes), live news feeds, and more help users to easily update and inform every other member of the team of changes and developments, which impact collaboration in a massive way. If you are considering IBM Blueworks Live it might also be beneficial to investigate other subcategories of Best Business Process Management Software collected in our base of SaaS software reviews. Every company is different, and might call for a specific Business Process Management Software solution that will be adjusted to their company size, type of customers and staff and even particular industry they cater to. You should not count on getting an ideal software that will be suitable for each business no matter what their history is. It may be a good idea to read a few IBM Blueworks Live reviews first and even then you should keep in mind what the software is supposed to do for your company and your employees. Do you require an easy and straightforward service with just basic features? Will you really make use of the advanced functionalities needed by experts and large enterprises? Are there any particular tools that are especially practical for the industry you work in? If you ask yourself these questions it will be much easier to get a reliable app that will match your budget. How Much Does IBM Blueworks Live Cost? We realize that when you make a decision to buy Workflow Management Software it’s important not only to see how experts evaluate it in their reviews, but also to find out if the real people and companies that buy it are actually satisfied with the product. That’s why we’ve created our behavior-based Customer Satisfaction Algorithm™ that gathers customer reviews, comments and IBM Blueworks Live reviews across a wide range of social media sites. The data is then presented in an easy to digest form showing how many people had positive and negative experience with IBM Blueworks Live. With that information at hand you should be equipped to make an informed buying decision that you won’t regret. What are IBM Blueworks Live pricing details? What integrations are available for IBM Blueworks Live? If you need more information about IBM Blueworks Live or you simply have a question let us know what you need and we’ll forward your request directly to the vendor.